Anyone submitting an application, proposal or report to the NIH must include the PMC reference number (PMCID) when citing applicable papers that they author or that arise from their NIH-funded research. Citing appropriately provides the NIH with the evidence that you are complying with the Policy. List the PubMed Central reference number (PMCID) at the end of the full journal citation for the paper in NIH applications, proposals and reports. A PMCID is the only way to demonstrate compliance for these papers. When a journal submits the final published article (Methods A and B) indicate “PMC Journal - In Process” or the PMCID at the end of the full citation. When an author or designate, or the publisher submits the final peer-reviewed manuscript, provide a valid NIH Manuscript Submission System reference number (NIHMSID) or PMCID at the end of the full citation. Reminder: NIH PIs are responsible for ensuring that all steps of the NIHMS submission process are complete within three months of publication. The PubMed Central reference number (PMCID) is different from the PubMed reference number (PMID). PubMed Central is an index of full-text papers, while PubMed is an index of abstracts. 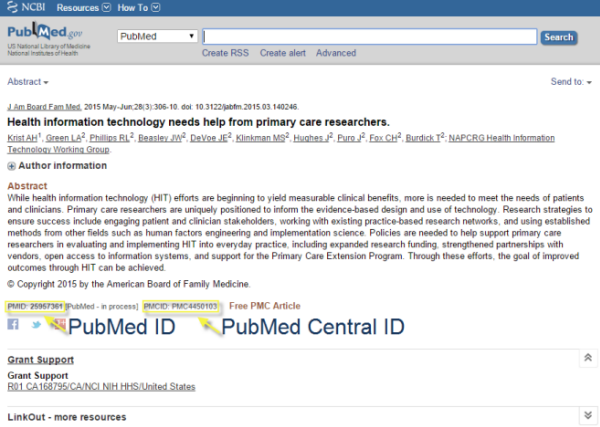 The PMCID links to full-text papers in PubMed Central, while the PMID links to abstracts in PubMed. PMIDs have nothing to do with the NIH Public Access Policy.